Its 2019 and general elections are on a roll. The country is already in an election mode. For BJP, replicating the 2014 performance will be difficult. The ruling party is facing tough competition from opposition parties. All the serious candidates and political parties are drafting or drafted their roadmap for 2019 election campaign. Generally, parties include print media, pamphlets, banners to their election campaigns. If you are looking for the bulk SMS for elections in Gurgaon, Delhi, Haryana etc., SMSLAB is the best choice for you. 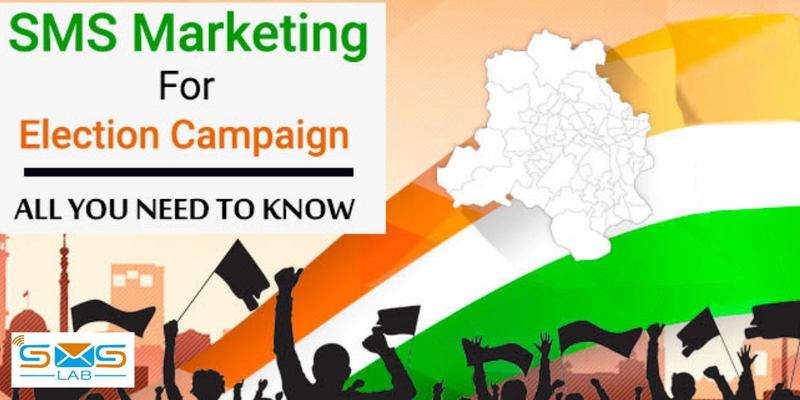 Here you can check about how Bulk SMS are Beneficial for Election Campaigns. Most of the political parties forget to include bulk SMS marketing which is the most important part of election campaigns. The election campaign is the deciding factor whether a political party is going to make it through the competition or not. Ignoring bulk SMS while planning the election campaign might be the biggest mistake you can commit. This single mistake can keep your party from winning. Running an election campaign is not so easy for the political parties in India. To get the support of people, it is very important to communicate with people. Just staging lectures and holding meetings is not enough for a good election campaign. Political parties need more branding and awareness generation. This can be achieved in different ways. But bulk SMS service is the most cost-effective way to convey the parties’ vision to the largest number of people. Contact SMSLAB if you are looking for the best bulk SMS service provider in Gurgaon. Bulk SMS has worked for election campaigns in the past. People always look for new ways of communicating with their political leaders. SMS is personal and one on one with a clear and simple message. SMSes have a huge outreach as everyone has access to mobile phones. Bulk SMS help you to connect with a wide range of audience. Deliver your message in a regional or local language. Send notifications to party members and supporters for meetings. Send reminders to the people reminding about elections. The researches have shown that SMS has a high response rate than any other mode of communication. The open rates of SMS are also very high. It is fast and way more effective in terms of opening rate and response rate. SMSLAB is known to be one of the best bulk SMS providers in Gurgaon and other parts of the country. Bulk SMS is one of the cost-effective and best promotional methods which any election campaign can have. Other forms of communications like print media, magazines, newspapers, banners, hoardings etc are also effective but you are well aware of the high costs involved in these kinds of advertisements. Sending Email is complex as you have to follow rules. No broken links, good subject lines, intact attachments are a must for Emails. But with bulk SMS, you won’t have to take care of so many things. Bulk SMS can help you to win the political position. Send appealing messages to your voters that encourage them to vote for you. Contact SMSLAB for the best bulk SMS service for election in Gurgaon. SMSes add a personal touch for your voters. SMS are as good as one to one communication with your voters. Your political message is delivered right to the mobile inbox of the users which they can read at any time of the day. SMS are short, exact and to the point. This helps the readers to connect better with the parties. A manifesto is a follow up to the campaign message. You send a message to voters telling them why you are a good fit for the position. You can send a list of reasons along with your accomplishments. You can send this several times ensuring that it remains in voter’s minds. Rallies are one of the conventional modes of campaigns for a long time and can’t be ignored even today. If you are going to organize a rally as a part of your election campaign, bulk SMS is the best way to convey voters about the place, time and agenda of the rally. Bulk SMS is an effective way to manage party meetings. The party members must have discussions on plans and strategies to work seamlessly. Bulk SMS is an effective way to inform the party members about the upcoming meetings and points to be addressed in the meeting. Bulk SMS is an effective way to remind the party members about the data and time of the meeting. I hope in this article “How Bulk SMS are Beneficial for Election Campaigns” you understand about the power of bulk SMS in an election campaign is real and can’t be ignored. It’s election season and even smallest of things can be ignored. Bulk SMS can play a vital role in your successful election campaign. If you are looking for the best bulk SMS company in Gurgaon, contact SMSLAB which is an affordable and best SMS service provider.